Ankylosing Spondylitis, an inflammatory disease affecting mainly the spine, can be characterized by abnormal bone formation (syndesmophytes) along the margins of the intervertebral disk. Monitoring syndesmophytes evolution is challenging because of their slow growth rate, a problem compounded by the use of radiography and qualitative rating systems. To improve sensitivity to change, we designed a computer algorithm that fully quantifies syndesmophyte volume using the 3D imaging capabilities of computed tomography. The reliability of the algorithm was assessed by comparing the results obtained from 2 scans performed on the same day in 9 patients. A longitudinal study on 20 patients suggests that the method will benefit longitudinal clinical studies of syndesmophyte development and growth. 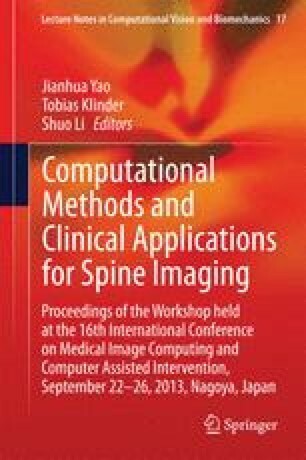 After one year, the 3D algorithm showed an increase in syndesmophyte volume in 75 % of patients, while radiography showed an increase in only 15 % of patients. Ankylosing spondylitis syndesmophytes volume measurement.